This post contains affiliate links. Read my disclosure policy. Thank you for supporting my brainstorms. So, I totally flaked out on you all last week with the whole Hope for Your Home Series. Did you miss me? You see, I’m saying to you and to myself that I’m only going to work on changing one thing at a time, but truthfully life keeps marching on with all it’s life stuff. Every single night, people in my home want dinner again. Do things work that way at your house? Also, I’m trying to blog consistently, and I keep changing my mind on what that looks like. I have two goals. So, last week I was feeling a little overwhelmed, and I had to do some stern but loving self-talk. I cannot give this blog enough time to make an immediate living wage, and homeschool, and chase littles, and tend a home, and enjoy my micro-gardening, and smile at people even when I’m tired, and plan and do the shopping, and play with the budget for the thirteenth time that payday, and . . .
Let’s everybody take a minute to breathe! Very slowly now. Feel your chest expand. Good. Now let it all out and relax all the way down to your toes. God’s got this. Be available to Him. So, what I really want to do with my writing time is write five blog posts a week bare minimum, publish four, and bank one for the future. I also want to send out one submission a week to a paying market, write up a haiku every day, write a Shakespearean sonnet every week, write two handwritten letters to whoever I feel needs it each week, write love letters to my immediate family each week, work at least an hour each on blog improvement, a bigger writing project, . . . . Okay, I think we need to breath again. Yeah, I tend to bounce between extremes. I believe that for the moment I’m going to aim for two blog posts a week. One about my current project or habit I’m working on, and one that journals about things I want to remember. The days pass slowly, but the years fly quietly by. I don’t want to forget these moments. I want to be thankful. I want to love on others with this gift of words. I don’t want to be chained to a blogging schedule that’s choking the life out of me. I’ve done that before. Confession: I didn’t finish all my dishes last night, but I did run the dishwasher, and I washed a few of the hand-wash only items. I also did a little freezer cooking yesterday. This is shredded chicken cooked in sweet and sour sauce. Plastic lizard not required. Cook up several meals worth of meat in the crock pot and then freeze them into meal-size portions. I do this with chicken, sausage, and ground beef. 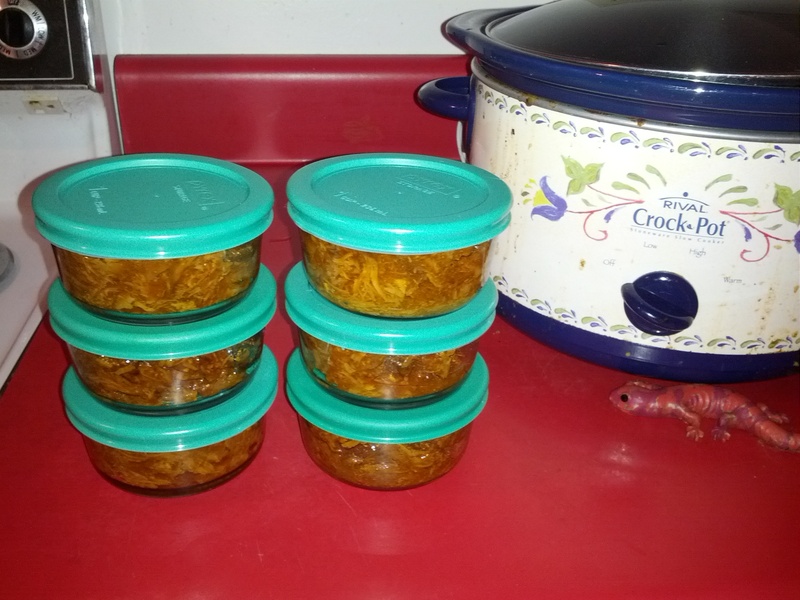 To save green and be green, use freezer-safe, reusable containers. I like pyrex in the one and two cup sizes, and I’ve been increasing my stash a little at a time. 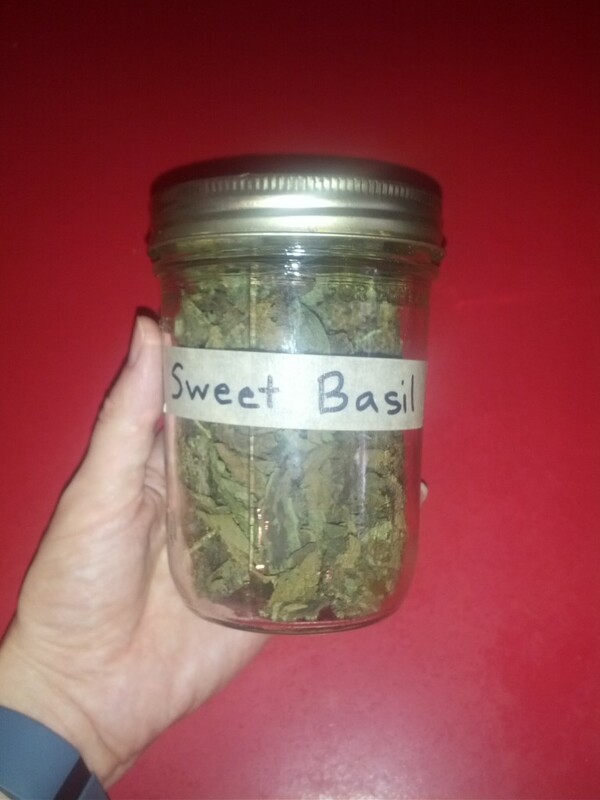 And I harvested and dried more basil yesterday. I really wish you could smell this. Wooohoooo! 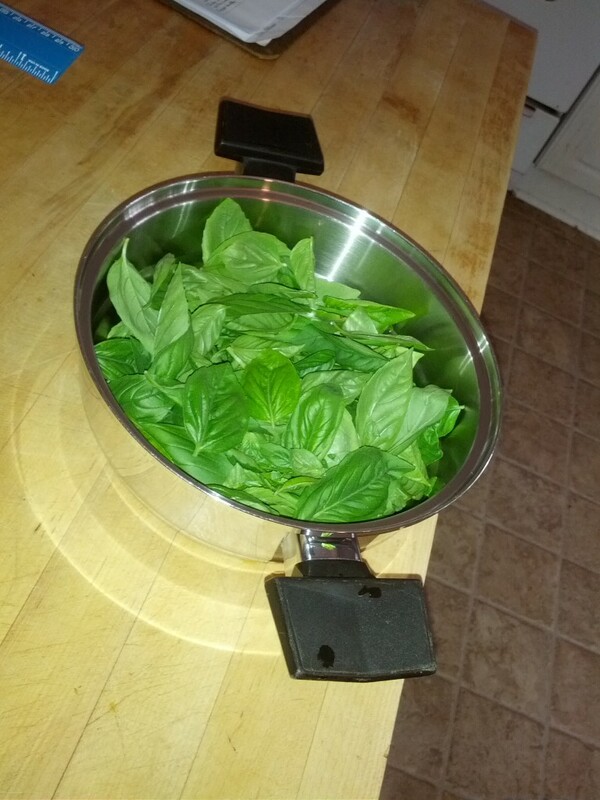 I won’t be buying any more weak basil from the store. Actually, I think I’ll have more than enough soon. I’m considering selling the extra. I need to explore those options. The day was not lost, and my kitchen was not a total disaster when I dropped into bed. It has truly been worse. So how is your journey of finding Hope for Your Home coming along? Is it maybe taking you a bit longer than twenty-eight days? That’s okay. Me too. You might master all the habits for a year and then feel blindsided by illness or tragedy. Don’t give up. Just go do your dishes.